Benefits and Uses of Tin Tin - is a chemical element in the periodic table that has the symbol Sn (Latin: Stannum) and atomic number 50. This element is a silvery metal poor, can be forged ("malleable"), is not easily oxidized in air so rustproof, is found in many alloys and is used to coat other metals to prevent corrosion. 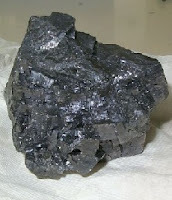 Tin is obtained mainly from the mineral kasiterit formed as oxides. The minerals contained in the ore minerals are generally main kasiterit, while pyrite, quartz, zircon, ilmenite, Plumbum, bismuth, arsenic, stibnite, chalcopyrite, kuprit, xenotime, and monazite are associated minerals. There are so many benefits Usability Lead and tin especially for raw materials metal coatings, solder, souvenirs, and others. Gray tin has little usefulness. Lead can be very slippery polished and used to cover other metals to prevent corrosion and chemical action. A thin layer of tin on the steel used to make the food last. Tin alloys is very important. Soft solder, bronze, Babbit metal, bell metal, white metal, alloy formation and phosphor bronze are some alloys containing lead. Tin salts are sprayed onto glass are used to create a layer of electrical conductors. This application has been used for auto glass that resists freezing. Most window glass is now made by floating molten glass on molten tin to form the flat surface (Pilkington process). More recently, the crystal alloys of tin-niobium becomes superconducting at very low temperatures, making this material a promising superconductive magnet construction. Magnet, which is made by the tin-niobium wire weighs only a few pounds but with a small battery that can produce almost the same magnetic field strength of 100 ton electromagnet which run large power source.